Park Jong-hum, Deputy Minister for Transport Policy and Logistics at the Ministry of Land, Infrastructure and Transport, said in this exclusive interview on the upcoming 23rd International Conference of Enhanced Safety Vehicles (ESV) in Seoul with NewsWorld, that the global event will boost Korea’s position as a nation with outstanding auto safety technologies, joining the ranks of such automotive powerhouse countries as the United States, Germany, and Japan as one of the 13 member nations of the ESV conference. The high-ranking government official also talked about the plan to develop Korea as a logistics hub in Northeast Asia, citing expanding trade volume among Korea, China, and Japan and government incentives for logistics companies expanding abroad, including easy loans from the Korea Exim Bank and for manpower training of logistics professionals. Question: Can you please introduce to our readers the 23rd International Conference of Enhanced Safety Vehicles, its scale and details of the meeting? 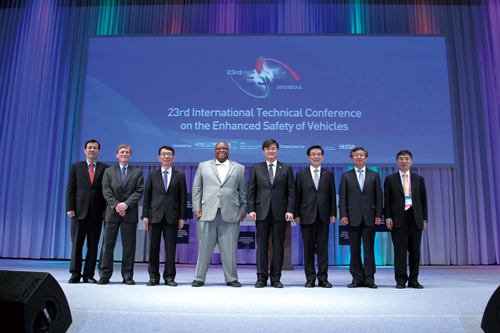 Answer: It is the most authoritative conference in the world as far as automobile safety technology is concerned. It was launched by the U.S. Road Transport Safety Commission in 1970 and now has 13 countries as members including the United States, Germany, and France. They meet once every other year and the member countries take turns hosting the meeting. Our country became a member in 2005 and expressed our desire to hold the meeting in Korea in 2009. And at the 22nd meeting in 2011, we decided to hold the meeting in Seoul in 2013. For the ESV conference in Seoul, government representatives from member nations such as the head of the U.S. Road Transport Safety Commission, representatives of major car makers from around the world including GM, Toyota, Hyundai, and BMW will introduce new auto safety technologies at the meeting this year in line with the theme of the Seoul conference, “Search for International Cooperation for Automobile Safety,” which was selected to prevent drastically various auto accidents through international cooperation amid the expanding internationalization of auto safety standards, sales, and production, among others. About 250 papers on the theme will be presented at the conference. 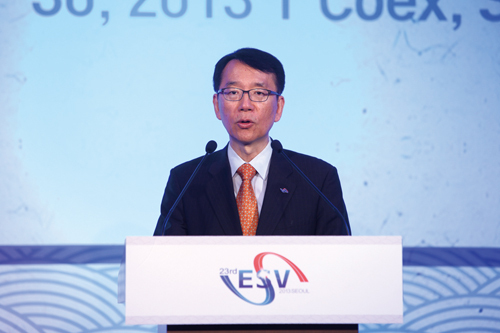 Deputy Minister Park Jong-hum speaks at the ESV conference. Q: Can you please name the major themes of the event, the companies to attend, and the Korean award winners? A: As for exhibitions, 29 government organizations, producers, and parts makers will operate their booths to display what they want to show to the public. The Ministry of Land, Infrastructure, and Transport, the Transportation Safety Corp., and the U.S. Road Transport Safety Commission are slated to publicize their government’s policies on transport safety, while such auto makers as Hyundai, Kia, GM Korea, Renault-Samsung, and Toyota, and parts maker Mobis will introduce new safety technologies for cars at the show. The theme of the conference, the Search for International Cooperation for Automobile Safety, is meant that we must seek means to drastically reduce auto accidents as car production, sales, and safety standards are being globalized. The ESV conference will present awards to 10 people who contributed to auto safety. At the conference in Seoul, four Koreans, two Germans, two Spanish and one each from the U.S. and Japan will get awards. The Korean winners will include Director Koh Eul-sok of Kia Motors, Director Kim Dong-sok of GM Korea, Professor Yoon Young-han of Korea Technology Education University, and Manager Kim Jong-soo of the Transportation Safety Institute, who contributed to showing the world Korea’s outstanding auto safety technologies. 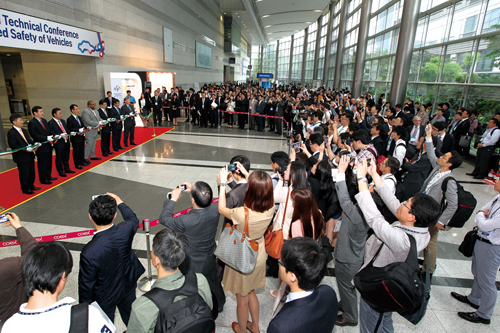 to open the exhibition event at the ESV conference on May 27-30 in Seoul. Q: Can you please tell us the significance and expected results of the ESV Seoul conference? A: Korea will emerge as a global leader in the area of auto safety after the ESV Seoul conference, a top authoritative meeting in the world in the area of auto safety technology. The conference will at the same time boost auto safety technology development with so many reputable professionals on auto safety technology presenting their papers to encourage international academic exchange on auto safety technology and the exhibition of new advanced auto safety technologies by companies related to auto production, leading to further intensive development of auto safety technology around the world. Q: Can you please introduce to us Korea’s auto safety technology policies that will lead auto safety technology related to international standards? A: Korea has been a positive participant in the activities for improvement of UN regulations and reform on autos related to the UN regulations at the UN/ECE/WP29. For example, 40 percent of auto accident deaths are pedestrians and Korea has played a major role in legislating regulations for pedestrians at the UN through research on the protection of pedestrians, which Korea then adopted into its domestic regulations. In order to take up such policies, the government has been focusing on the evaluation of high-tech auto safety features and Korea will participate in the establishment of UN regulations by playing a key role with the results of its study so far. Q: What are the Park Geun-hye government’s major policies for the resurgence of the logistics industry? A: The government has been working on the creation of conditions to help boost the logistics industry. In order to perk up the industry, the third party logistics transfer system under which the government covers up to 50 percent of the consulting expenses for firms using third party logistics, should be extended to international logistics, and they should provide additional incentives to the companies using international logistics in the form of tax cuts to expand the firms using third party transfers. The Ministry of Land, Infrastructure and Transport has been holding consultations with the related ministries to reduce the unfair competition in the industry, such as giving logistics business such as cargoes for shipment to affiliated logistics firms. Q: Please explain the status of the progress of the government plan to build a systematic base to make Korea a strong logistics nation and plans to strengthen the competitive power of the logistics industry? A: In order to make Korea a globally-leading logistics country, the government chose a number of logistics firms to help grow with its support, including various special incentives, and devised a list of “Logistics Firms to Grow to be Global Logistics Companies.” The government selected a number of logistics firms in June last year based on the standards set up in December 2011 for the selection of logistics firms to be developed into global logistics firms. The six selected firms include Bumhan Pantos, CJ EGLS, Jangkum Commercial Shipping, Hanjin, Hyundai Glovis, and Hyundai Logistics. The government has also been looking into making Korea a logistic hub in Northeast Asia in view of the increasing trade volumes between Korea, China, and Japan. The combined freight is being carried out between Korean harbors such as Incheon, Pyeongtaek, and Kinsan, and Chinese ports including Weihai, Qingdao, Iljo, Sokdo, Yongan, and Yontae, and experimental multimodal freight is being conducted between ports in Japan and Korea since October 2012.